Before this past Saturday’s game against Wisconsin, I had the opportunity to talk training with Jim Snider, the men’s hockey teams’ strength and conditioning coach. Jim is a really bright coach who has done a great job while working with current and former Badgers over the years. As we were talking, we got into a conversation about squats. Jim said “Better skaters are good squatters.” I totally agree with him. When I think about some of the players that I was fortunate enough to work with over the years that were fast, explosive, and low to the ice skaters, it’s not hard for me to think about guys like Selanne and Kariya (although I never got to work with them at the same time (I wish I did). These guys absolutely loved to squat and in fact- had to squat during the season. Now, was it their ability to squat well that helped them skate great? Or was it their ability to skate great that made them good squatters? I’m not sure but I do know that for those guys, they were back squatting way before I knew them. 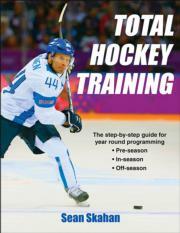 In fact, Teemu was learning how to squat and Olympic lift with broomsticks when he was 8 years old! The point of the post is not too say that hockey players need to put lots of weight on the bar and start performing heavy back squats. However, the movement of squatting bilaterally shouldn’t be neglected in training or ignored. Even though our program consists of many variations of single leg exercises, we will squat bilaterally in warm up often and we will front squat during the off-season and perform clean+front squat combos. 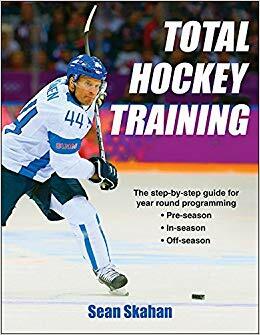 I really believe that squatting well and squatting often will help any hockey player not only produce more force into the ice but also help maintain a lower center of gravity for longer periods of time. My friend Maria Mountain shared this with me. I must admit that I have never done too much “goalie-specific” work with goalies in the past. However, this first video makes me re-think some things. I can see using this on lateral days in the off-season. I remember studying for my Matrix Algebra exam in first year of university. I somehow convinced myself that the really tough questions were too hard and would never find their way onto the exam paper. Wow – was I wrong! I was making the same mistake lots of hockey players make in the gym all the time. I was working on the things I was good at and discounting the things that gave me trouble. 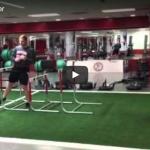 In today’s video I want to share two exercises that gave a goalie real trouble during a training session this summer. This goalie was in great shape, was a great athlete, but had these deficiencies that he wasn’t even aware of. You probably have a few as well. So watch the video to see what I mean and how we corrected his patterns – I bet the changes we made to the first exercise probably helped him bump his save percentage up. So don’t ignore your strengths, but when you find something that gives you trouble, take the time to clean it up. Hey everyone- I just wanted to take a few minutes to update you on what’s going on at HockeySC.com. Obviously, the hockey season is in full swing. The site has been updated with new articles, videos, programs, and forum topics pretty frequently. Also, we are in the works in getting the Hockey Strength Podcast back up and running. We are planning on talking to lots of the site contributors on future episodes. Stay tuned. We also have some current ongoing discussions on our forum including topics such as HRV, Late specialization, on-ice testing, and PRI amongst others. We really think that we have the best site on the internet for hockey strength and conditioning. If you aren’t a member, you can try us for 7 days for $1.